Webdesign by Lorna - Portfolio - Kinabalu Rent A Car Sdn. Bhd. 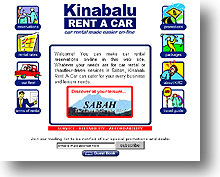 Kinabalu Rent A Car Sdn. Bhd. There's no complicated coding involved in this web site. It has, however, some interesting animated graphics such as the bottom part of the logo where a car speeds off, and an image which swaps from their discount notice to the Mt. Kinabalu scenery. Even though there's two animated graphics on the page, it still doesn't distract you from navigating through the entire site because of the interesting iconic menu. You will find that this site is very informative, fun, and quite useful albeit its simple layout and navigation. If you plan to travel by land around the state of Sabah, the Travel Guide can help you get started with your journey. Tools & skills used: HTML, Microsoft FrontPage, Adobe Photoshop, Microsoft GIF Animator.